I ate: We ordered from the a la carte menu rather than the Christmas set menu as my colleagues preferred to have more choice. I was really pleased as it gave me the chance to try steak tartar: a dish made of chopped raw steak, mixed with onion and seasoned, and served in a round patty with a raw egg yolk on top. I've wanted to try it for years as I love rare meat but was always too nervous to order it when I wasn't sure if I would like it. Because it was available as a starter, and I could have something I knew I would like for the main course, plus the fact that I wasn't paying, I decided to give it a go. 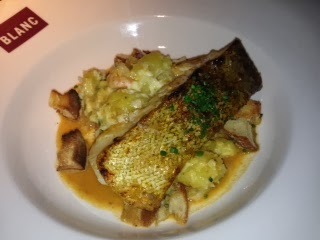 For my main course I had pan-fried Atlantic cod fillet with prawn potatoes and prawn butter. 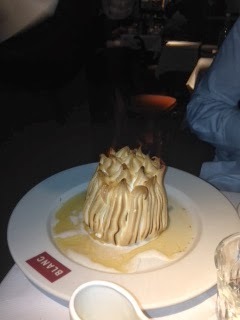 We all decided to have a dessert and one younger colleague was intrigued by the idea of a baked Alaska as she had never heard of it. That particular dessert is made for two to share, so we decided to have it. My companions ate: One colleague had snails as her starter which I thought was very brave! Steak was a popular choice for main courses. The food was: Excellent. My verdict on the steak tartar: really tasty, and it didn't actually feel that much like eating raw meat - more like very rare hamburger. It came with some sourdough bread, or if you have it as a main course it comes with fries. My main course was very nice but not that filling - the prawn potato was a small amount of crushed potatoes with a few pieces of prawn mixed in if I recall correctly. My colleagues all enjoyed their food immensely. The baked Alaska was nice but nothing special, with just vanilla ice cream inside the meringue, but it was done 'properly' i.e. doused with alcohol and set on fire as it reached our table, which was fun! The atmosphere/service was: Very good, our French waitress knew her way around the wine list and was able to make good recommendations. 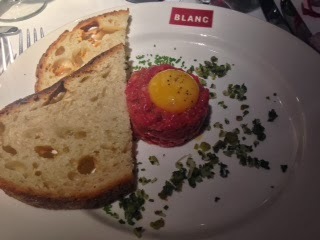 Price range/value for money: Pretty expensive (but obviously a lot cheaper than Raymond Blanc's other restaurants) - the steak tartar was £9.90 as a starter and my fish main course was £17.40, which I thought was quite a lot for what it was. It was very nice though. Would I recommend it? 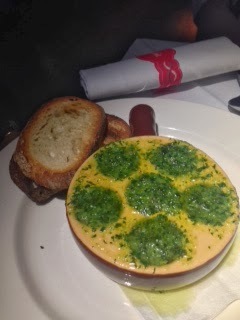 Yes - high quality French food at fairly steep prices for a chain, but a good restaurant none the less. raw meat and raw egg----no thanks,you are welcome to it! But you've eaten snails - I know which one I'd rather have! !